i have to try my best to take back everything i ever thought or said about matt barnes or his mustache. he’s fast becoming one of my favorite players to watch (along with barbosa, iverson, mcgrady, and deng). and it’s not just his mohawk, although that certainly goes a long way in becoming a favorite. he’s just super cool. his wingspan to height ratio is probably exactly what mine is. he’s fast, he has a good shot and a great floater, he hustles on defense, he saves balls from going out of bounds with the greatest of ease. in game 6 last night, they passed it cross-court to him and it was way high. i thought it would be a turnover for sure, but he jumped up (probably higher than dwight howard in the dunk contest), caught the ball, and fired a one handed pass back across the court and jason richardson hit a 3-pointer. 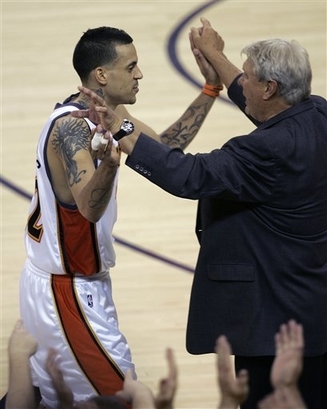 matt barnes has stolen my heart and i don’t mind if he and don nelson like to hold hands. not even a little bit. my favorite thing about last night, though, was after the utah-houston game when charles barkley was sad that utah won. it had nothing to do with the jazz or the rockets. he was hoping to go to the floyd mayweather jr/oscar de la hoya fight in las vegas on saturday. but now he has to work. i couldn’t believe how sad he was. “i’m stuck here with you two losers while everybody else is in vegas.” it made me really feel bad for him. no kidding. i sort of know how he feels because i’ve had to miss out on pretty exciting things due to work-related commitments. and he doesn’t have the sort of job that he can just get someone to cover for him. i like charles barkley and i’m sad that he has to analyze the jazz-rockets game instead of watching that fight from the front row. he probably has like a million dollars on the game and now he has to have dwyane wade text message him all the details. what a way to hear about losing (or winning) a bunch of money. they should make a commercial where wade says he’ll cover for charles on TNT if charles will put him in his fave five. even better, they should really make that deal. unless wade is having shoulder surgery on saturday. suns vs. spurs: suns in 6. i still don’t like amare stoudamire, but i’d marry him if it would piss off robert horry or bruce bowen. but i do hope that old man duncan banks in shots from every angle. bulls vs. pistons: bulls in 7. ben gordon wins it in game 7.
nets/raptors vs. cavaliers: it doesn’t matter who wins tomorrow, they’ll beat the cavs in 5. see ya, LBJ. While I agree that the winner of Toronto/New Jersey will beat the Cavaliers, the Warriors don’t have much of a chance against the Rockets/Jazz. The problem with Dallas is they let Golden State play how they wanted: fast. Both the Jazz and the Rockets will slow the game down and make the series a matchup of size and strength instead of speed. The Warriors would probably win a cool contest with these two teams (but only if I put aside my bias towards the Jazz), but they won’t win a basketball-playing contest. If they do, I will start being attracted to girls.